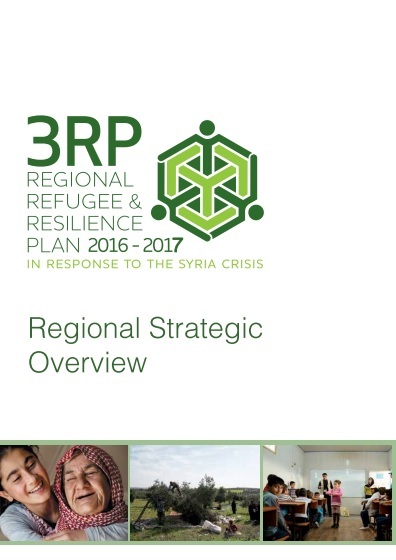 Read the regional strategic overview of the Regional Refugee & Resilience Plan (3RP) and access the Latest Updates on the Syria Situation. Individual 3RP country plans are available here. Over the last 12 months, the number of registered Syrian refugees in the Republic of Turkey, the Lebanese Republic, the Hashemite Kingdom of Jordan, the Republic of Iraq, and the Arab Republic of Egypt has increased by more than 1 million, bringing the overall total to almost 4.3 million. Based on the most recent trends in displacement and population growth, and with access to safety in some countries becoming increasingly managed, it is expected that some 4.7 million Syrian refugees will be registered in the region by the end of 2016. Fighting has intensified in almost all Syrian governorates, driving thousands more people from their homes. The 2016 Syria Humanitarian Response Plan estimates that there are 13.5 million people in need, of whom 6 million are children and 6.5 million are internally displaced persons (IDPs). A political solution is urgently needed to end the conflict in Syria and bring about peace, stability and eventual voluntary return of displaced people in safety and with dignity.